COVINGTON, Ky. — The shelter-in-place order for Covington neighborhoods in the vicinity of Latonia Avenue has been lifted. 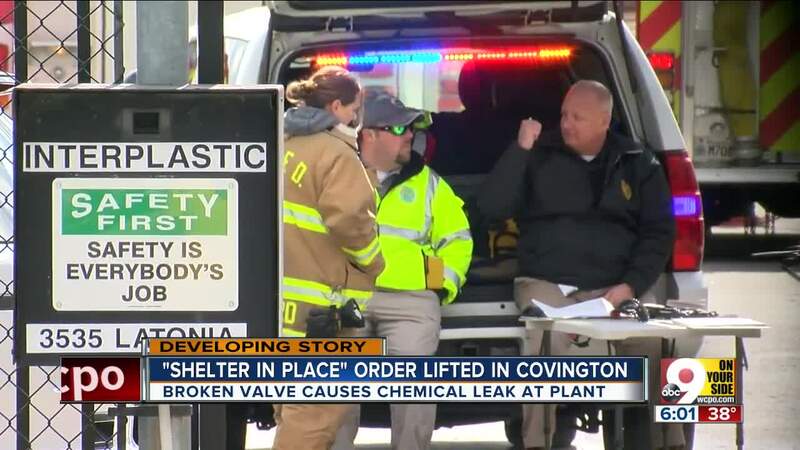 Covington police advise that the chemical leak has not been fully stopped, but “it’s greatly reduced to the point where it’s no longer a concern,” Assistant Chief Bloemer said. A shelter-in-place order went out to Covington, Kentucky residents Sunday afternoon after a cloud of white-smoke was seen in the air near the Interplastic Corporation plant at 3535 Latonia Ave. According to a post on Facebook from the City of Covington, an "equipment failure" caused the release of a chemical into the air. The chemical, according to Mike Bloemer, Covington Fire Department Assistant Chief of Training and Operations, is considered a "lung irritant." Fort Wright firefighters, Kenton County Homeland Security Emergency Management and other regional hazardous materials teams are assisting on scene. Residents within 1,000-feet of the plant are advised to stay in their homes and to close all doors, windows and vents.